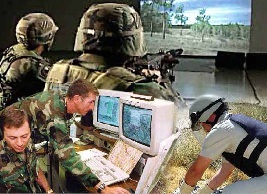 ABACUS, the Advanced Battlefield Computer System, is a war game simulation developed by Raytheon Company for command and staff training. ABACUS simulates a complex, realistic battlefield environment designed to put a team's critical decision making skills to the test. The stressful simulation exercises are particularly useful to military and community organizations for practice working together in times of civil challenges. A team of less than 6 military officers and maintenance engineers form the central command post, creating scenarios and running exercises for up to 170 stations and 2000 people. These exercises can run 24 x 7 for up to two weeks fueled by up to the minute, real time data. ABACUS uses the EMPRESS RDBMS to store the thousands of pieces of information it uses for training exercises. From weapon system ranges, to weather conditions, to vehicle loading time, information is easily entered and manipulated via a data editor. An EMPRESS API makes runtime checks on data during a test run of the simulation exercise to catch any problems before they might jeopardize an actual training event. Inconsistent values trigger an error message delivered to the command console indicating a problem.
" Since integrating EMPRESS in ABACUS five years ago, we have had little or no need for technical support. The product simply operates as desired and does it with no trouble." ABACUS is an internationally NATO used training application that can be tailored to meet the specific demands of a variety of organizations, both military and civilian. On the frontier for ABACUS is the development of FCAST, the Future Command and Staff Trainer.
" We are happy with the way EMPRESS works for us and are likely to use EMPRESS with every new system that we deploy," concludes Mr. Fasulo.